velofix , North America’s largest fleet of Mobile Bike Shops rose to meet the rapidly increasing demand for the speed and convenience of mobile bike service by closing out 2016 with its strongest year to date. velofix’s best year ever saw 300% year-over-year revenue growth, the launching of the velofix DIRECT complete bike sales program, and the establishment of key distribution partnerships with premium component manufacturers like Shimano, SRAM and FSA. Backed by a brand new website and powered by a proprietary route-optimized booking service, the leading Mobile Bike Shop platform also added 44 more Mobile Shops in 2016, bringing its coverage total to 89 franchise territories, and cementing its place as the preeminent choice for cycling needs in North America. 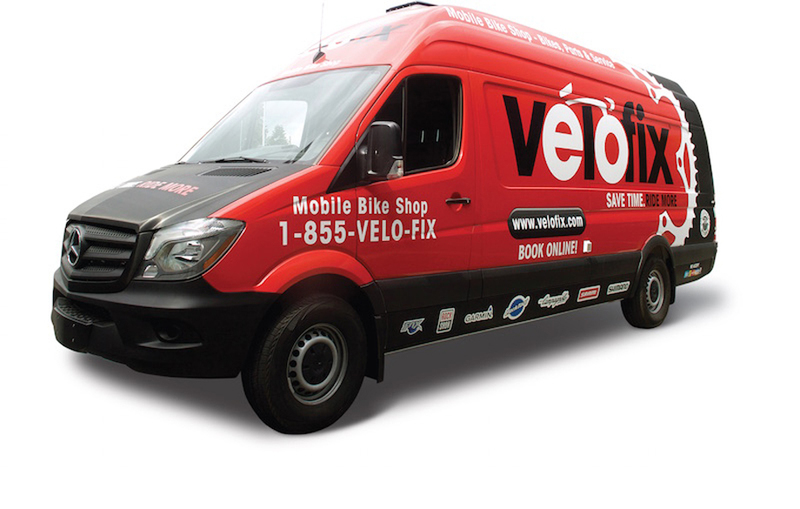 velofix launched its first mobile shop in January 2013 and has quickly capitalized on a demand for direct service by growing its representation to nearly every major North American market. Besides repairs and its direct-to-consumer bike sales program, velofix operations offer sales of individual components, accessories and sports nutrition to complement every customer service. velofix franchises also offer fleet sales and maintenance, full-service employee bike repair, and lunchtime learning sessions for bicycle safety and basic maintenance education for corporate clients. Brand new velofix website HERE: www.velofix.com. VELOFIX Bike Tune Gets Pez! Founded with a passion for cycling, Mobile Bike Shop fleet velofix was launched in Vancouver in 2012 by Chris Guillemet, Boris Martin, and Davide Xausa, who all share that passion for cycling and the common belief that bicycles can help change the world. Recognized by Entrepreneur Magazine as “one of the most impressive mobile franchises,” velofix has also been featured on the CBC’s Dragon’s Den (Canada’s version of Shark Tank), which resulted in Jim Treliving coming on board as an investor. Charles Chang of Lyra Growth Partners has also invested in velofix. Currently, 75 franchises operate in every major Canadian market and most key American markets. velofix currently has plans to expand to a total of 150 franchises across North America in 2017.